Sue Ettinger, DVM, DACVIM (Oncology), is a practicing veterinary cancer specialist, international speaker, and book author. She is one of approximately 400 board-certified specialists in medical oncology in North America. She received her veterinary training at Cornell University and completed her residency in medical oncology at The Animal Medical Center in New York City in 2003. She is a passionate advocate for early cancer detection and raising cancer awareness. Your pet has cancer. This may be one of the hardest things a veterinarian has to tell a client. Breaking bad news is stressful and unpleasant and has been described as “dropping a bomb.”1 Unfortunately, veterinarians frequently have to break the bad news of cancer to often-unsuspecting clients. As a veterinarian, how does it affect you? How do you prepare the client? Yourself? When, where, and what will you tell him or her? One in 3 dogs of any age and 50% of dogs over 10 years of age will get cancer, which is the number one cause of canine death.2 Many pets are considered important family members, and many pet owners have increasing expectations for compassionate, high-quality medical care and respectful communication. When a pet has cancer, however, the human–animal bond becomes stressed and fragile, making veterinarian–client communication more challenging. Delivering bad news is a complex communication task, and carrying such a burden of responsibility can be stressful for veterinarians and veterinary team members.3 Complicating factors include team members’ experience (or inexperience) communicating bad news, the relationship with the client and his or her pet, and the often limited treatment options. The client’s response is affected by the severity of the diagnosis, his or her relationship with the pet, past experiences with other pets or human family members with cancer, other life stressors, and his or her support system. The manner in which bad news is delivered is key to clients’ understanding and their satisfaction with their veterinarian. Poor communication can lead to general dissatisfaction and a loss of the client’s trust. When using the data dump technique, often nicknamed the shot-put technique, the veterinarian does most of the talking in monologue style and the client remains passive. The intent is on delivery of information, but often the client cannot absorb and understand so much information. The collaborative approach, often nicknamed the Frisbee technique because the conversation goes back and forth, is more inclusive. This reciprocal interaction focuses on delivering information in small pieces and eliciting client feedback. By adding open-ended questions to the conversation, the veterinarian can ensure the client is on the same page. This 6-step protocol was established to help deliver bad news, such as a cancer diagnosis. Oncologists, oncology trainees, and medical students who have learned the protocol report increased confidence in their ability to break bad news.5 Not every instance of breaking bad news will require all 6 steps, but in cases that do, use the following sequence. Prepare for the stressful task by reviewing your plan for breaking the bad news, mentally rehearsing what you are going to say, and deciding where you will say it. Too many clients hear Your pet has cancer delivered in an inappropriate manner and setting (eg, on the phone after test results are finalized), which makes the conversation more difficult because the veterinarian cannot make eye contact and connect with the client. (See Common Cancer Communication Mistakes.) Ideally, the client should be told in person and in a private location (eg, an examination room). Feeling negative, frustrated, or responsible is normal. You may be delivering sad, devastating news, but the information will allow the family to plan for their pet’s future. Use the following guidelines to set up the conversation. Arrange for privacy. An examination room is ideal. Consider involving significant others; the client may find having an extra set of ears is helpful. Asking clients if they want to conference call a family member or record the conversation on their smartphone can be useful. Sit down to relax the client and show you are focused on them and not in a rush. Remove physical barriers (eg, examination table) between you and the client. Make a connection with eye contact. If the client is comfortable, consider gently touching the client on the arm, holding his or her hand, or offering a hug. Before sharing medical information with the client, gather information. Determining the client’s level of understanding and helping the client identify concerns is crucial. Use open-ended questions to try to get an accurate picture of what the client knows and how he or she is feeling. Start questions with how, what, and tell me. Consider beginning with What have you been told about Bear’s lymphoma? or What have you been told about Oscar’s chest radiographs? These questions can help correct misinformation (eg, chemotherapy is not well tolerated in pets) and tailor the bad news to the client’s level of understanding. Elicit the client’s perspective. Does he or she have previous experience with cancer in people or another pet? Identifying misinformation about cancer and potential barriers to care is important. The following questions can help guide the conversation. What are your goals for treating Bo’s cancer? Some clients want complete information about the diagnosis, prognosis, and details of the illness, but some do not. Others may want more information later. If clients do not want details, offer to continue the conversation at another time or talk to a friend or relative. Determining to what degree the client wants information—and being aware this may change with time—is also important. Since many clients are initially overwhelmed, beginning with the big picture and asking what they know already and what additional information they are seeking is often helpful. Warning that bad news is coming (eg, Unfortunately, I have some bad news) lessens the shock. Then pause. Remember to use nontechnical terms (eg, spread instead of metastasis, sample of tissue rather than biopsy or fine-needle aspirate). Responding to the client’s emotions, which can include disbelief, sadness, denial, or anger, is one of the biggest challenges. Let clients express their feelings, and be sure to respond with empathy. Put yourself in their shoes and communicate that you know where they are coming from by saying, I can only imagine how hard this is—Nemo has been part of your family for so long or I can see how upsetting this is for you—I was also hoping for different results. Clients will often feel alone and in shock. Offer partnership and use inclusive language (eg, let’s, we, our, us) with comments such as We will work together for Teddy. Asking permission during the conversation can help determine the client’s readiness to take the next step. Ask the client, Would you like to schedule surgery? or Are you ready to start chemotherapy? Combining empathic, exploratory, and validating statements is one of the most powerful ways to provide support because it reduces the client’s isolation, expresses solidarity, and validates the client’s feelings. Taking time to reflect what the client heard, repeat key diagnostic and treatment aspects, and provide a summary at the end of the appointment can be useful. For example, I recommend these tests and this treatment for Bo’s oral melanoma, but there are other options. What questions do you have? Clients who have a clear plan are less likely to feel anxious and uncertain, so check the client’s understanding (or misunderstanding) of the diagnosis and the treatment options. Address pain control and relief from clinical signs for the patient, and always consider referral to a specialist. Will This Take More Time? A client’s initial reaction may be to not treat at all, but it is important to still provide information about the diagnosis, treatment options, and prognosis. Providing accurate information about cancer and a range of treatment options can help replace the client’s misperceptions and fear with knowledge and hope and can help the client understand that pets with cancer can live longer and live well—not only after treatment but also during treatment. 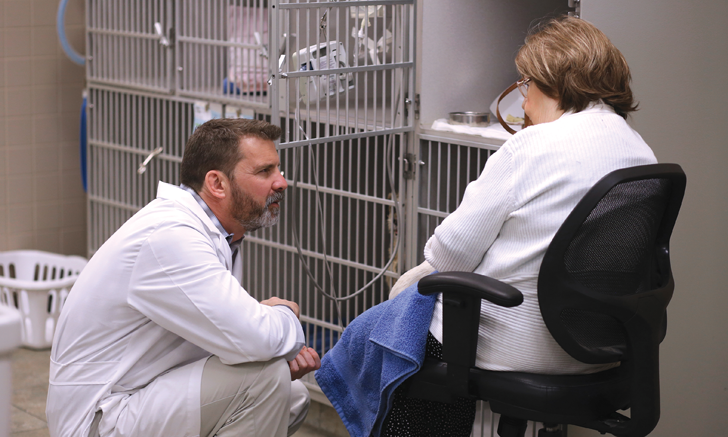 If the veterinarian is overly optimistic, clients may lose opportunities to fulfill last wishes, prepare themselves and their family, and spend quality time with their pet. Avoiding the prognosis may make the veterinarian appear evasive or dishonest, which risks the trust and relationship with the client and could compromise the patient’s care. Do not make assumptions about what the client wants to know. Ask, How much would you like to know about the course of Myles’ lymphoma? Use the “Chunk and Check” strategy to make sure the client understands the information, recommendations, and options being presented. Balance hope and reality. Sharing the median survival time can be helpful. Acknowledge the client’s emotional reaction. Remember to compose yourself, pace yourself, and allow time to reflect. Poor communication can lead to general dissatisfaction and a loss of trust. The SPIKES method allows the veterinarian to gather information, determine the client’s knowledge and expectations, support the client’s emotional response with empathy, and develop a strategy and plan. Before saying, Your pet has cancer, stop, mentally rehearse, and focus on empathy and respect. Demonstrate appropriate nonverbal behavior by sitting at the same level as the client, maintaining an attentive body posture, and making eye contact. Speak slowly, lean forward, and reach out to touch the client if he or she is receptive. Provide sufficient privacy, time, and attention, and be sensitive and flexible. Be aware of the issues for you and the client and know where and how you will break the news. Every case and every client is different, but veterinary teams can learn how best to handle the task of breaking bad news and make the conversation less difficult for their clients and themselves. 1 Always plan ahead before discussing a cancer diagnosis with a client. The veterinarian should decide what he or she is going to say and choose a private place to break the news. 2 Take care to listen to the client’s perspective, remember that every client is different, and provide only as many details as he or she wants. Miyaji NT. The power of compassion: truth-telling among American doctors in the care of dying patients. Soc Sci Med. 1993;36(3):249-264. Fleming JM, Creevy KE, Promislow DE. Mortality in North American dogs from 1984 to 2004: an investigation into age-, size-, and breed-related causes of death. J Vet Intern Med. 2011;25(2):187-198. Shaw JR. Relationship-centered approach to cancer communication. In: Withrow SJ, Page R, Vail DM, eds. Withrow & MacEwen’s Small Animal Clinical Oncology. 5th ed. Philadelphia, PA: Elsevier Saunders; 2013: 272-279. Silverman J, Kurtz SM, Draper J. Skills for Communicating with Patients. 2nd ed. London, UK: Radcliffe Press; 2005. Baile WF, Buckman R, Lenzi R, Glober G, Beale EA, Kudelka AP. SPIKES—A six-step protocol for delivering bad news: application to the patient with cancer. Oncologist. 2000;5(4):302-311. Shaw JR, Bonnett BN, Adams CL, Roter DL. Veterinarian–client–patient communication patterns used during clinical appointments in companion animal practice. J Am Vet Med Assoc. 2006;228(5):714-721. Ramirez AJ, Graham J, Richards MA, et al. Burnout and psychiatric disorder among cancer clinicians. Br J Cancer. 1995;71(6):1263-1269.